Disclosure: I was not compensated for this post. I received media tickets to attend this event. All opinions are my own. 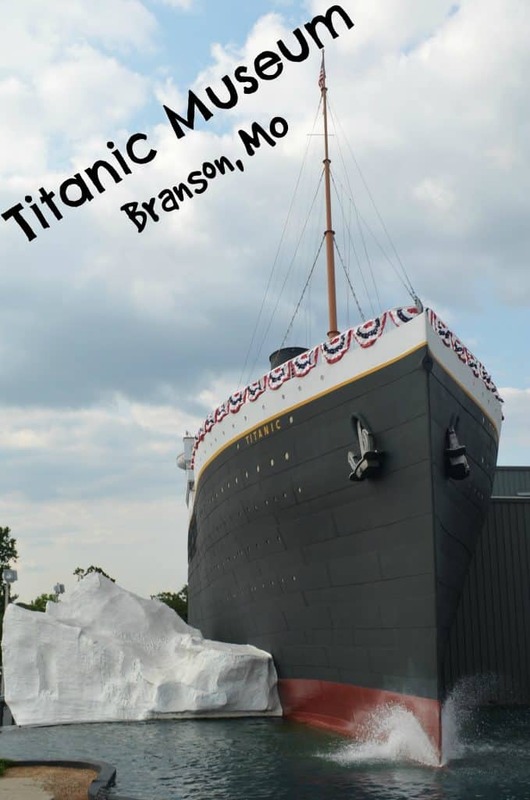 The one attraction I wasn’t sure how my 7 & 5 year old boys would do was at the Titanic Museum in Branson, MO. Let’s face it – boys like to run around instead of reading the exhibits in a museum so I was quite curious to see how they would respond in such a somber setting as at the Titanic Museum!! However my kids actually quite enjoy educational experiences and learning about the Titanic certainly intrigued them so we headed over to the museum on our last morning in Branson. I was quite dismayed when I arrived and noticed that they do NOT allow any sort of photography at all so be forewarned to leave your cameras at home if you visit! So I apologize in advance for the lack of photos in this post!! I know it’s hard to capture the full experience of our review without photos, but there is an online virtual tour on the Titanic Museum’s website that you can enjoy to see more glimpses inside the museum. 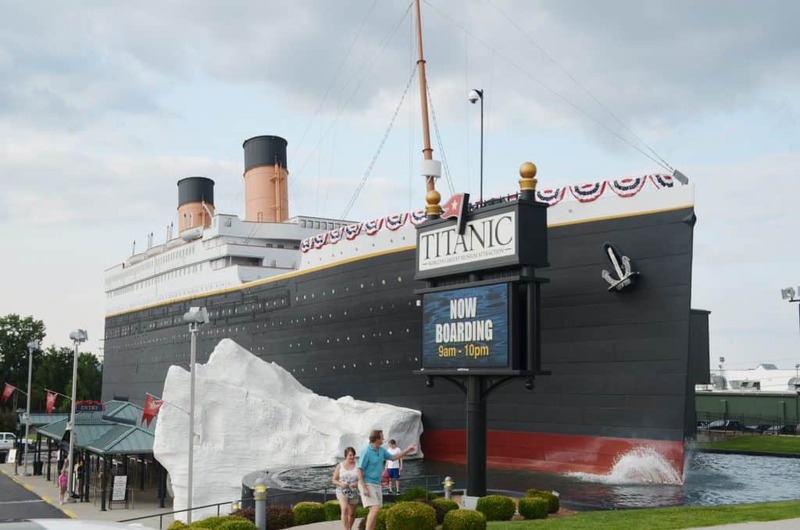 Driving by the Titanic museum of course immediately got my kids excited as they would soon be climbing aboard this “boat” museum! Even though we had just spent the day before at a big theme park they each seemed just as excited to visit the Titanic Museum in Branson. As we arrived we were each handed a nice exhibit card with the name of a real Titanic passenger on it along with their age, class, residence, and story. My boys were each handed special cards telling the story of one of the children actually on board the Titanic. As you travel through the museum it’s fun to see if you can spot any exhibits referring to your card, and at the very end of the museum you can look on a large wall (color coded for kids cards!) to see whether your passenger survived the Titanic or not. It was certainly a somber experience as you look through the passenger list and see just how many fatalities there were that day put to name – especially the crew members. My husband, who had a crew member passenger card had not survived, but the children’s passengers and I all did. 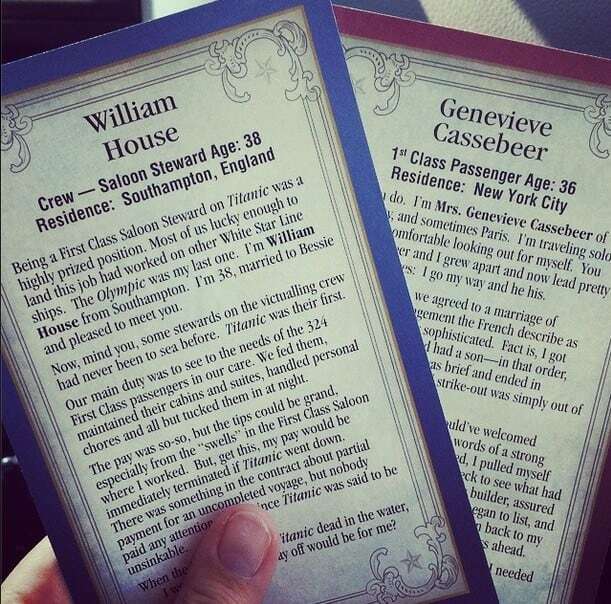 It was neat to read the stories for each of our surviving passengers as they continued their lives past the Titanic experience. The exhibits themselves were quite extensive and stunning – it’s just absolutely amazing the items that just happened to be carried off board of the Titanic during such a tragedy. The museum certainly boasts quite a priceless collection of objects from the Titanic including but not limited to ticket stubs, photographs, life preservers, menus, dishes, etc. They also incorporated some images from shipwreck dives to show what the Titanic looks like now as well. There were a few hands-on exhibits such as an actual replica area of the Titanic deck at different times during it’s sinking which the kids were able to try and climb up. There was also the huge block of ice representing the iceberg that was hit, as well as the bowl of “cold” water representing the temperature that the ocean would have been as the Titanic was sinking and the challenge to see how long you could keep just one finger in it! There were stories of newlyweds on the Titanic, crew members and passenger’s bravery, children and their lost toys, and all sorts of amazing stories that gave you such a personal glimpse into the lives of the passengers on board. Although not a cheap visit this is the nicest and most extensive Titanic Museum that I have ever visited. You even were able to walk up a replica of the grand staircase to get up to the second floor of exhibits. And of course the chilly “outdoor” room to simulate the chilly air the night the Titanic sunk. Both of my boys behaved very well and were quite interested in the exhibits! I was rather impressed how involved they seemed at each exhibit as they expressed interest to learn more about each station. We will certainly be following up with our children throughout the year and add some Titanic books and activities to their collection to help continue their education and interest after visiting the museum!